For downloading to Apple devices, please see the iPad Download Instructions and diagrams at the bottom of this page. Q. "Full" screen, "Wide" screen, or "Blu-ray"? Which is best for you? There are two common screen shapes most people will recognize — the squarish shape of conventional TVs, and the wide screen shape of today's flat screen HDTVs. The term used to describe TV screen shape is "aspect ratio" — conventional TVs have a 4:3 aspect ratio known as "standard" or "Full screen," and widescreen HDTVs have a 16:9 ratio similar to a movie screen ratio. We produced our 4:3 dvds from 2005 to 2010. When flat panel TVs and HD video cameras came out people wanted the 16:9 Wide screen videos. If you own a Blu-ray player, we recommend Blu-ray rides for the utmost in clarity especially if using a large screen to display the videos. If you have a fitness club, you will dazzle your customers with the "realness" of our Blu-Ray forward motion scenery. We are one of few companies producing cycling videos in Blu-ray, we personally love the larger screen resolution. Q: Does the speed in the videos slow down when you go uphill? A: Yes! And it speeds up going downhill. Q: The video previews on your site seem kind of slow (or kind of fast). Why is that? A: Don’t worry, they’re just right in the context of each ride- it really depends on the road, the incline, how wide it is and the surroundings. Sometimes, lots of vegetation like low-hanging branches will make it seem like you’re really going fast and vice versa on a really wide-open flat road. We usually travel between 15-25 mph. Once you try Bike-O-Vision for a while, you will feel like you’re actually there, biking down the road. Q: How long are they? A: The latest Wide screen and Blu Ray journeys are the longest at 62- 112 minutes long. The full screen rides are mostly 74 minutes long with the exception of #1 European Sampler which is 35 minutes in length. Q: Do they come with music? What kind of music do they have? A: Yes! The music is all up-tempo, instrumental (no singing) and varies from title to title. It has a wide range from contemporary “workout” music with techno and rock beats to jazz, country, folk, new age, blues, Latin, Caribbean, and symphonic/orchestral. You'll hear an average of 30 different upbeat music cuts on each cycling dvd. In general, the themes tend to go with the landscapes. For example, the St. Croix U.S. Virgin Islands dvd has a lot of Caribbean music with steel pans, polyrhythms, and uptempo guitar music while background music for Hawaii’s Big Island is more Pacific rim/ Asian and yet still has an “island” feel. Also there is some “accent music”, such as drum-and-fife pieces in Historic Washington D.C. and Maryland, which add to the specific mystique of a particular location. Q: Can I turn the music off and use my own? A: Certainly. Just play your favorite cd or radio station in the background instead. Q: Do you ship to Canada and other countries? How much is the shipping? A: Yes! People all over the world are now getting involved doing Bike-O-Vision cycling workouts and we’ve sent dvds to over thirty different countries, but mostly Canada, UK and Australia. The shipping to Canada or any country out of the US is extra. Please allow an more days for delivery. We most often ship by USPS Priority or Priority Express Mail. Q: Will you be doing more journeys in the future? Q. Do you have PAL dvds for Great Britain? A. We produced PAL dvds for many years but since International Region Free DVD Players have become popular and inexpensive, we stopped producing them. Check with us as we may have a few titles left in stock. Q: How long will each half of these take to download? A: About 3 to 8 minutes, depending on your internet connection. Q: Why can’t I just download these and play them on my tv? A: They are a smaller size than your tv so they would be blown-up and fuzzy. They are made to be smaller, 640 x 360. Also, your tv would have to be able to play .mp4 files. Q: What does the size 640 x 360 mean? A: That’s the number of pixels of the video. Regular dvds are 720 x 480. So these are smaller pictures, quick to download and they are perfect for tablet, iPad or iPhone. Q: Do you offer larger sized downloads 1280 x 720 for my TV or wall screen? A: Not yet, we had problems with the larger files so don't currently offer them. We suggest the Blu-ray videos for large screens. Q: Why would I want an iPad download when I already have the dvd or Blu Ray disc version? A: You can take an tablet or iPad just about anywhere- to the gym or on vacation with you for example. Q: Why do the downloads come in two parts? A: This is for your convenience. It makes the files smaller. For example if you only have space for half a video on your device, you can put the other half on your computer. Also, if your download gets somehow interrupted, you would only have to start all over on that half. Q: Are these the same videos as the dvd and Blu Ray versions? A: Mostly, yes! In a few cases they have been shortened by a couple minutes and spruced up in places. You may also notice an occasional Bike-O-Vision logo appearing in places. These are only on the download versions. Q: iPad instructions When I click the download link the video starts streaming on my iPad but does not "save". 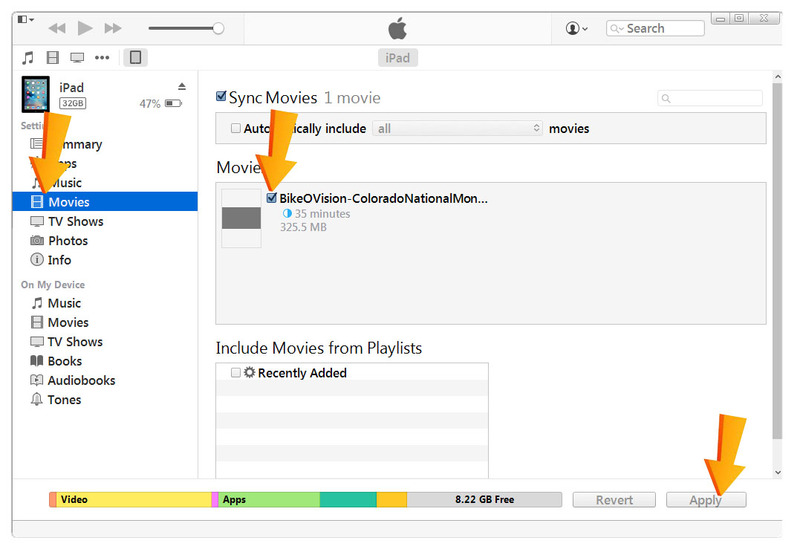 How do I save the Bike-O-Vision video (mp4) onto my iPad? A. You need to sync your iPad up to your desktop computer first in order to play mp4 videos on an iPad. First, connect your iPad device to your desktop computer. Open iTunes and select the movies folder. On your desktop computer open the order confirmation email you received from Bike-O-Vision with your links. Download the Bike-O-Vision file from your email. Open the folder of the file that was downloaded. 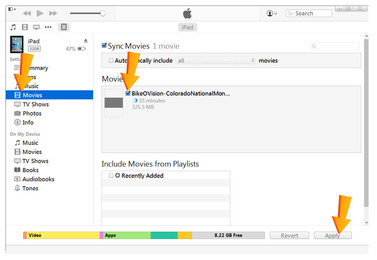 Drag the (Bike-O-Vision title) .mp4 file from the download folder into your iTunes movies folder. Make sure the movies you want to load are checked. I think I've found a simpler way. I have Dropbox but it should work with any cloud drive. I downloaded the file to my laptop and saved it in Dropbox. I have linked my Dropbox account to my IPad and can open it directly from Dropbox. So you can't use your link to directly download to the IPad but you can retrieve it and play it in this way.